Musica Romana is a prototype I made of a location-based mobile web site presenting music written for churches in Rome. 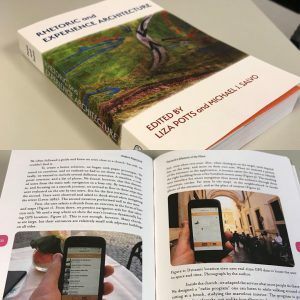 I have summed up my experiences in the chapter: «Toward a Rhetoric of the Place: Creating Locative Experiences«, in Liza Potts and Michael Salvo’s Rhetoric and Experience Architecture (Parlor Press, 2017). Thanks to Parlor Press’ commitment to open access, you can download my chapter here. Even better, of course, would be to buy the book from the publisher’s website or from Amazon. Dette innlegget ble skrevet i Designteori, Mobile medier, Publikasjoner, Retorikk, Teori, 11/09/2017 av Anders Fagerjord.